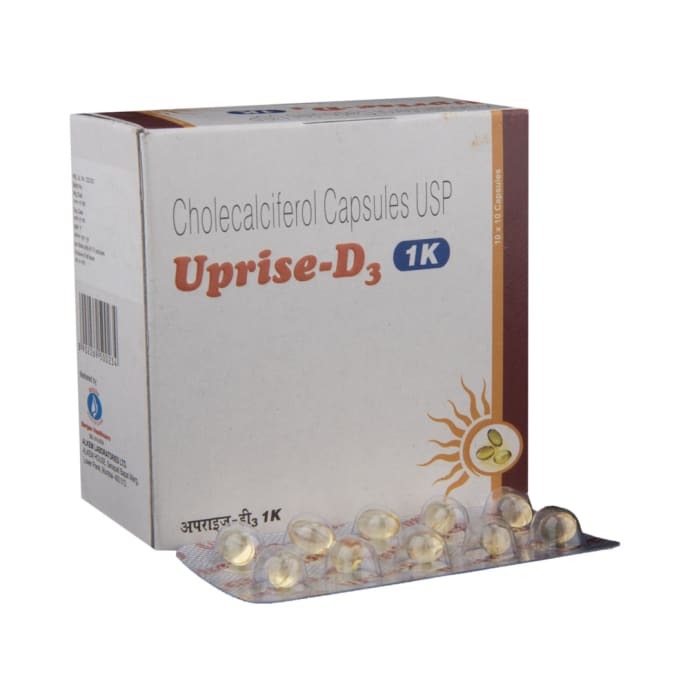 Uprise-D3 contains Cholecalciferol 1000 iu (International units). Cholecalciferol (Vitamin D3) which is a fat soluble vitamin, that helps the body to absorb calcium and phosphorous found in food and supplements. Vitamin D is made by the body when skin is exposed to sunlight. Sunscreen, protective clothing, limited exposure to sunlight, dark skin, and age may prevent getting enough vitamin D from the sun, thus leading to Vitamin D3 Deficiency. 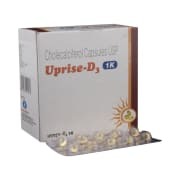 Thus, Vitamin D3 in Uprise-D3 capsule is essential for calcium absorption in the body. A licensed pharmacy from your nearest location will deliver Uprise-D3 1000IU Capsule. Once the pharmacy accepts your order, the details of the pharmacy will be shared with you. Acceptance of your order is based on the validity of your prescription and the availability of this medicine.